The presence of faked, forged and pirated goods is a threat for brands. They can be protected by RFID, assigning an identifier code to each product. Both customer and merchant benefit from this solution. Customers may check the originality and quality of purchased products while merchants are guaranteed that their products are not false copies. MobileKnowledge has developed an anti-counterfeiting solution, ready to use with an NFC-based, mobile Android device and a Web Server based on Google App Engine. The mobile Android app, compliant with Android 4.0 and upwards, ensures that the product has been registered by the merchant against the web server, which tracks the products UID and the queries. 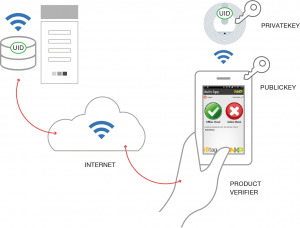 This solution employs asymmetric cryptography for the NFC tag verification. It also uses the uniqueness of the NFC tag UID for the product authentication in the backend server database. Moreover, the developed framework allows merchants to obtain real-time statistics on the products being verified. They can then combine the authentication functionality with marketing offers and loyalty applications, which a mobile phone can trigger.